This guide assumes you have already successfully logged in to the spam firewall. For instruction on how to do this, please Click Here. After you log in to the spam firewall you will be taken to the Activity page. This page will show you all the emails that have come through the firewall, as well as what action has been taken with the email itself. In order to modify your firewall white lists and black lists you will click on the "Filter" tab at the top of the page where you will be taken to a white list/black list area. This page allows you to add email addresses to whitelist which means they will always be allowed through, or blacklist meaning any messages sent by that email address will be blocked no matter what. This can also be done for domain names, meaning any email address from a certain domain can either be whitelisted or blacklisted. In the image below you will see 3 entries under the "Black List" tab. This will block any emails sent from the addresses info@fakeemails.com and spam@spamsenders.com. It will also block emails from ANY address that includes the domain name spambot.net. 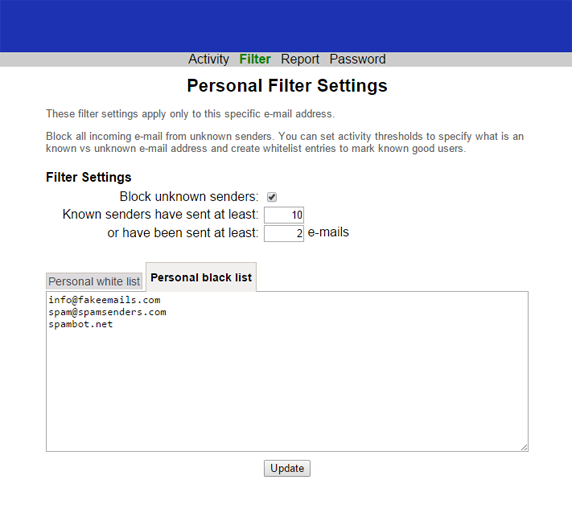 This page will also allow you to select an option of "Block unknown senders." This allows you to automatically block emails from everyone who has sent you less than a certain number of emails, and/or have received a certain number of emails from you. In the image above, for example, the email address will only accept emails from those addresses that have sent 10 or more emails previously, or from addresses that you've sent 2 or more emails to. **Please be careful with the whitelisting and blocklisting of domain names. This will allow or block ANY email address associated with that domain name itself. For example, if you blocklist Gmail.com that means you will not receive any email from anyone with a Gmail.com account.